Once gamblers were convinced: there’s nothing in this world able to outstrip the global phenomenon of the Wheel of Fortune, IGT’s absolute apex that made them inevitably famous. However, the tea is that Aristocrat made it big, too, when their Buffalo series emerged out of the blue. Masses went crackpot, casino operators joined them in this madness, and…so it goes. Lots of time has passed but arguably Buffalo slot games are still the one and the only, like Elvis and Madonna. And because Buffalo has style – these are kinds of machines that would never grow old no matter what advances the industry pushes through. We have a unique theme perpetuating exquisite American wildlife, a bunch of technological breakthroughs in terms of gameplay and, of course, a good load of bonuses. Are you excited? For those who know their way around Aristocrat’s Buffalo, here’s ‘a spoiler’: primarily the article’s going to discuss the first release in the series – original Buffalo slot. What makes Buffalo so especially special? Probably one could bow to Aristocrat’s genius in a wordy accolade, but let’s keep things simple: this machine came and destroyed the mold. First off, Buffalo, just like most of other casino products by Aristocrat, was designed for land-based establishments on an international level. Hence the popularity and fanbase to have amassed before the game hit the online. Secondly, fancy 1024 ways-to-win concept that used to be overwhelmingly refreshing back in 2008, when the only unusual slot system was considered to be 243 winways. Finally, a budget-friendly return: Buffalo was bursting with wins. Manufacturers working offline kept their hand deep in strict RTPs percentages and never let them go beyond 89-92% (according to the place). Buffalo showed its generous side and offered a better option – 93%. The online software got amended so that to meet the demand, and Buffalo integrated a new win distribution featuring around 95-96%. Since the game was literally crammed with goods (read: bonuses), this was a bold decision to raise the return to a low-variance grade. As a result, Buffalo asked for a penny, but gave a big fat dollar, and one must admit players didn’t have to stick around for long to get rewarded. So probably when speaking of why Buffalo’s positions in the gambling market remain up high that’s due to fair return. You are allowed to enter the environment where ‘stakes-wins-spins’ proportion has a nice taste. The game is loaded, and you are taken onto a wonderful trip across decent graphics, well-depicted symbolics and consistent aesthetics. If you’ve ever seen a wildlife library, then you’d certainly appreciate the way in-game symbols are drawn. They seem quite realistic and detailed, nothing appears pushed or irrelevant. 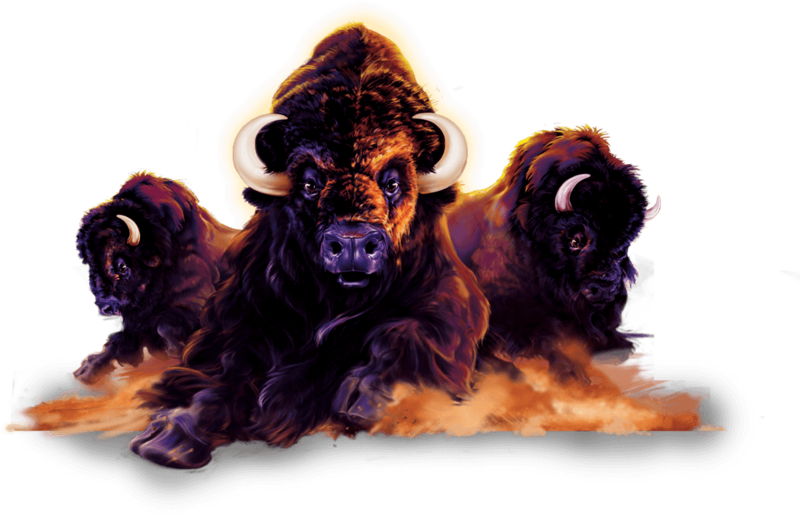 The titular character, Buffalo, is actually the American Bison, animatedly running toward the player against the purple background of the symbol. Other icons include the Panther, the Bald Eagle and the Wapiti. Well, Buffalo slot renders a real culture with each elements being on its place. Aristocrat animated all the main symbols, so as soon as you’re close to a win combination, pictures start moving that adds great crescendos to the game. Soundtrack, though, leaves a lot to be desired regarding how much work has been done to the visual part. Other than that, a pair ‘backdrop-reels’ goes hand in hand and shares many colors, one symbol even repeats the sunset scenery from behind. So, Aristocrat are keeping doing a good job at their slot machines’ outfits. As far as you can see, Buffalo not only offers winning chances by the 1024 format, but also nails features completely. Here you have freespins that are more like bonuses within bonuses, Wilds and Scatters, progressive multipliers and a portion of dedicated bonus rounds triggered separately from freespins. The machine features unusual multipliers. They appear along regular symbols on the grid, and whenever multipliers join a winning combo, they communicate and multiply within one another. So during the base game you can expand wins up to x27. Deluxe. Here Aristocrat provides unique freespins instead of unique multipliers. Gamblers are free to select from various setups – some offer high-value symbols, some deliver more spins than other etc. Grand. Five jackpots, a wheel of luck to take risks and a 4/5/5/5/4 reel format to keep you satisfied. Legends. This one is a mixture of Deluxe and original Buffalo where players can spin the reels of any of them right in a single slot. Stampede. Progressive title, latest in the series, incorporates fresh features to the game such as freespin options, Expanding Wildcards and a few additions to jackpot allocation. 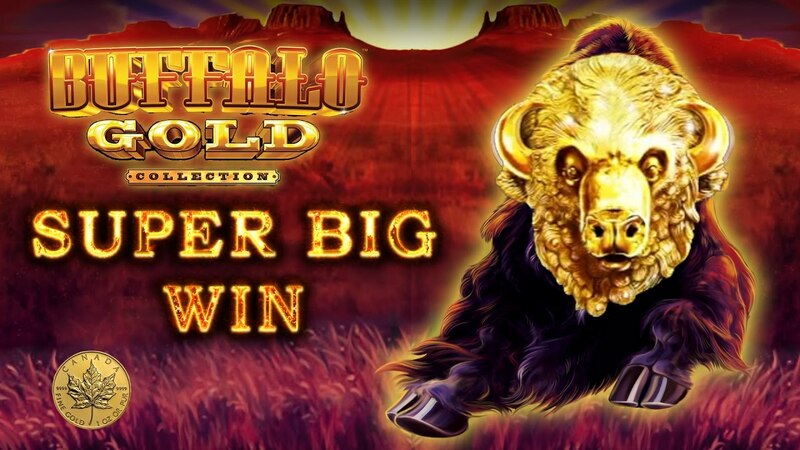 Low bets, abundance at bonuses and features, adjacent wins, high paying capacity, a couple of totally unique takes at design and mainstay appeal make Buffalo better than any high-profile slot machine from reputable software makers. The game is old, but it’s still number one and open to new loyal gamblers to swell the ranks.